My rating: 3.5 of 5 stars. Alright, I loved this book. It took me a while to realise this, but I did. At it’s very core, Dragon’s Teeth is about getting there and getting back. That’s right, it’s a Wild West The Hobbit. Except without the hobbits. Or dwarves. Or… well maybe it’s not really like The Hobbit at all, don’t judge me. At first the premise seems simple: punk city slicker kid lies to aging, workaholic professor in order to gain a spot on his expedition and win a dumb bet he made with a colleague. This premise falls apart, however, as the story unfolds and Crichton takes you on a breathtaking rollercoaster ride involving Sioux natives, rogue cavalrymen, high noon duels, blood feuds, femme fatales and good old fashioned shootouts. What I once considered fact was quickly turned to fiction – within the context of the story, of course – and our main lead is at first led helplessly through event after event, until he finally finds his feet and his decisiveness begins to shine. Johnson, typical Yale student and spoiled rich kid, is severely unlikeable in the first few chapters. Professor Marsh, a dinosaur-obsessed palaeontologist with a chip on his shoulder the size of the Empire State building leads an expedition in to the Wild West Badlands in the search for dinosaur bones. Professor Cope is, at first, Professor Marsh’s mysterious rival, a degenerate gloryhound who’d murder his own mother for the chance to show Marsh up in their eternal professional (and personal) feud. But the mystique is lifted, and Cope enters the stage as a character far more nuanced and layered than Marsh describes him. It’s at this part of the book that Crichton’s talents as a writer also shine. I’m not a big Crichton reader, but I have read another of his novels, Next, and one thing I can definitively say is that he writes with a sense of purpose that few other writers have managed to accomplish. 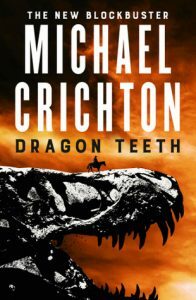 Every word he pens, every sentence he crafts, every paragraph, character arc, plot point he formulates exists for a very distinct reason; superfluousness simply isn’t a word in Crichton’s vocabulary, and as a budding writer myself I admire him for that. But this, unfortunately, occasionally led to some very dry and soulless writing. There were parts of the book where the writer in me understood why certain events were glossed over, or certain others were described in great detail, whereas the reader in me yearned to hear more (or less) about those aforementioned events. It’s hard to convey without spoiling the novel, so I won’t, but a lot of it does come down to personal preference. Dragon’s Teeth is a technically proficient novel, but there were times where I struggled to find its soul, its heart. But those moments were few, and Dragon’s Teeth had more than enough highlights to allow a reader to gloss over those lowlights. While it took some time, this Dragon eventually sunk its Teeth in me and didn’t let go until the very end.